The Human Givens way of understanding and developing human potential and dealing with what blocks it, is a comparatively new approach. The work primarily of Joe Griffin and Ivan Tyrrell, it first appeared in 2003 with a book that reached 15 on Amazon’s sales list when it was first published. 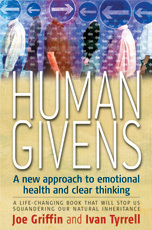 Information about their work on anger, additional to what’s in Caring Together, can be found on the Human Givens website where there’s also information about the book and CD they’ve published on the subject. The website also outlines the basic ideas of the approach which starts from the assumption that every human being has a set of physical and emotional needs together with the resources to meet them. These are listed if you scroll down this page of their site. Among their publications, their book published in 2011, Godhead: The Brain’s Big Bang explores the implications of their ideas to spirituality and the meaning and origin of life. It has been very well reviewed. For further ideas about anger from Sue Parker-Hall (mentioned in the comments in the Reflecting section of this session) click here.